GROB offers a broad product range for the most diverse applications. Our product range delivers solutions adapted specifically to meet the requirements of a modern and efficient production facility. Take advantage of the decades of experience and innovative know-how garnered by GROB and discover the right application for your projects. GROB universal machining centers and system machines guarantee you the best milling results with the most diverse materials. 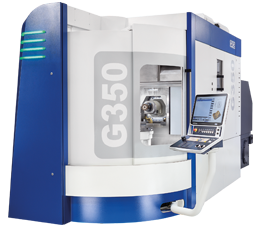 The GROB 5-axis universal machining centers offer you the ideal solution for highly precise mill-turn operations. The GROB systems – built from a great variety of standardized modules – guarantee optimum results in the assembly technology sector. Use the automation solutions for GROB machines and systems to ensure highly productive and flexible manufacturing. The digital GROB-NET4Industry applications ensure transparency in your production process in the Industry 4.0 era. The GROB G500TS thermal spraying system optimizes your crankcase manufacturing process. GROB's innovative winding technologies ensure the effective manufacturing of electric motors and alternators.